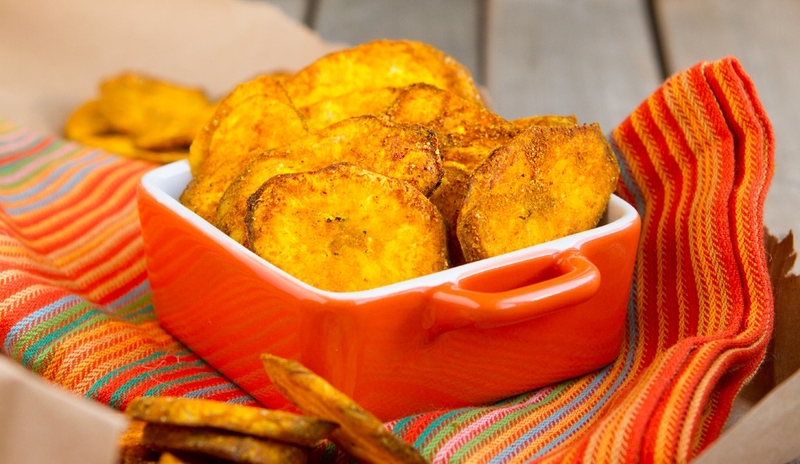 Switch up your salty snack routine with a reliable source of clean energy, plantains. Rich in dietary fiber, vitamin C, vitamin A and potassium, these banana doppelgängers are rich in resistant starch, a prebiotic that promotes the growth of good bacteria. 1. Preheat oven to 350°F and set a baking sheet aside. 2. Peel plantains by cutting off the top and running a knife alongside. The peel is very thick and the plantains are very woody. This is normal. Once peeled, slice on a bit of an angle. 3. Place sliced plantains in a large bowl. Toss with melted palm oil until all slices are covered evenly. 4. In a separate bowl, combine spices. Then, pour over plantains and toss to coat. 5. Spread coated plantain slices onto prepared baking sheet. Transfer to the oven and bake for 15 minutes before rotating to the other side and baking for another 10 minutes. At this point, some slices will be complete, others will not. Remove the crispy slices from the baking sheet, placing on a cooling rack. Return the sheet back to the oven and repeat, every 5 minutes. Total cooking time for some of the larger slices is 35–40 minutes when all said and done. 6. Allow to cool completely and dig in. Store in a plastic container on the counter for a couple of days, or the freezer for 1–2 months. Green Plantains: This recipe will not work with bananas. Red Palm Oil: Could be replaced with coconut oil, grass-fed tallow or avocado oil. Ground Coriander: Could be raw or roasted, whatever you prefer. I used roasted.